Sennheiser, one of the key players in the audio technology industry, has showcased what is termed as a 3D soundbar at the ongoing CES 2018 conference. The soundbar is a first from the company and has a total of 13 speakers facing the users or top. The soundbar falls in the company’s line of ‘Ambeo’ branded devices and is nothing more than a concept. As reported by The Verge, the Sennheiser Ambeo soundbar is scheduled to launch by end of this year. Although the prototype’s body is said to be unfinished, the speakers are working. 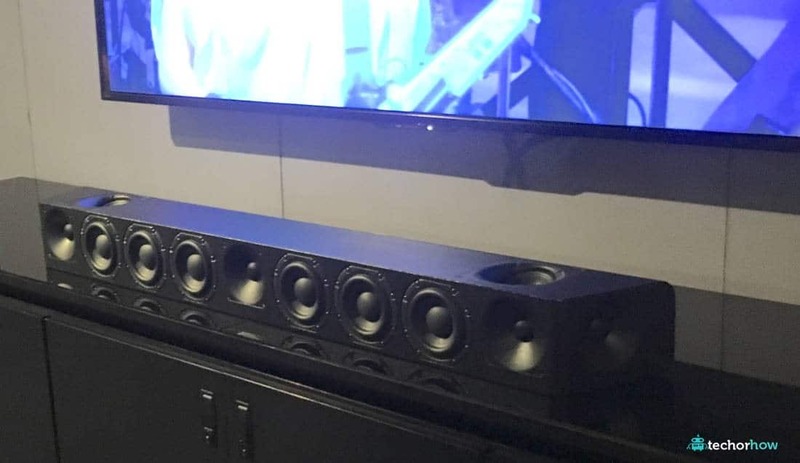 Sennheiser showcased the prototype at CES 2018 and has reportedly received much appreciation from criticsSennheiser, one of the key players in the audio technology industry, has showcased what is termed as a 3D soundbar at the ongoing CES 2018 conference. The soundbar is a first from the company and has a total of 13 speakers facing the users or top. The soundbar falls in the company’s line of ‘Ambeo’ branded devices and is nothing more than a concept. It has been mentioned that the speaker has 13 drivers, which are present in six four-inch woofers, five tweeters and two top-firing speakers. As mentioned by Digital Trends, the drivers are made by Neumann, the audio company recently acquired by Sennheiser. The bar also supports Dolby Atmos, MPEG-H codec and is also said to support DTS:X in future. With the sound bar still in prototype stage, Sennheiser hasn’t put a price tag on it. The news report adds that this won’t be highly priced but will be in competing limits with other similar devices from Samsung, LG, Yamaha among others. Sennheiser, at CES 2018, also a gaming headset with high noise-cancellation. Named Sennheiser GSP 600, the gaming headset is adjustable. It also has a material that won’t stick to the skin, meaning it is sweat proof. Gamers also get an inbuilt microphone in the headset. It has been reported that the accessory will be made available later this month at $249.95 and could come with two-year worldwide warranty. Audio products have made a big splash at CES this year. Both Google and Amazon have made some huge announcements for spreading their own virtual assistants to more devices and users. Google has confirmed its is working with select OEMs for a smart speaker with displays. Amazon has announced its Alexa Mobile accessory kit, using which any developer can integrate Alexa in any device.